The Carpathian National Park in Ukraine's Ivano-Frankivsk Oblast was established in 1980 to protect the landscapes of the Carpathian Mountains. Destination Ukraine, a large country in Eastern Europe with a coastline at the Black Sea and the Sea of Azov, it is bordered by Russia in northeast and east, Belarus in northwest, Poland and Slovakia in west, Hungary, Romania, and Moldova to the southwest. Ukraine covers an area of 600,000 km² making it the second largest country in Europe after Russia, it is about twice the size of Italy or slightly smaller than the U.S. state of Texas. Ukraine's landscape consists mainly of plains and plateaus, only the Carpathian mountains in the west reach 2,061 m (6,760 ft.) at Mount Hoverla (Hora Hoverla), the highest mountain in the country. The country has a population of 45.4 million people (in 2016), capital and largest city is Kiev, spoken languages are Ukrainian, Russian is widely spoken, especially in the eastern and southern parts of the country. Ukraine, a country in Eastern Europe, and the second largest country in Europe after Russia. The Crimean Autonomous Republic - encompassing the Crimean Peninsula, or Crimea, in the south was included in Ukraine's borders but is now occupied by Russia. The country is rich in natural resources, Ukraine has been fought over and subjugated for centuries; its 20th-century struggle for liberty is not yet complete. A short-lived independence from Russia (1917-1920) was followed by brutal Soviet rule that engineered two artificial famines (1921-22 and 1932-33) in which over 8 million died, and World War II, in which German and Soviet armies were responsible for some 7 million more deaths. Although independence was attained in 1991 with the dissolution of the USSR, true freedom remains elusive as many of the former Soviet elite remain entrenched, stalling efforts at economic reform, privatization, and civic liberties. formerly: Carpathian Ukraine, Ukrainian Socialists Soviet Republic. Constitution: First post-Soviet constitution adopted June 28, 1996. Location: Eastern Europe, bordered on the West by Poland, Slovakia, and Hungary; on the Southwest by Romania and Moldova; on the South by the Black Sea and Sea of Azov; on the East and Northeast by Russia; and on the North by Belarus. Terrain: mostly flat; 95% of lands are plains and 5% are mountainous. Ethnic Groups: Ukrainians, Russians, Belarusians, Moldovans, Hungarians, Bulgarians, Jews, Poles, Crimean Tatars, and other groups. Agriculture products: Grain, sugar, sunflower seeds. Natural resources: Coal, iron ore, oil and gas, gravel, salt; biggest ozocerite and brimstone deposits in the world. Exports - commodities: ferrous and nonferrous metals, fuel and petroleum products, chemicals, machinery and transport equipment, foodstuffs. Imports - commodities: energy, machinery and equipment, chemicals. External links will open in the top browser window. Supreme Council of Ukraine is is Ukraine's parliament. Ukraine's Permanent Mission to the United Nations. Map showing the administrative divisions of Ukraine. Searchable map and satellite view of Ukraine. 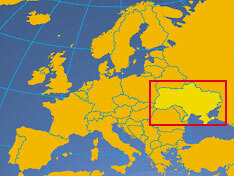 Searchable map and satellite view of the Autonomous Republic of Crimea. 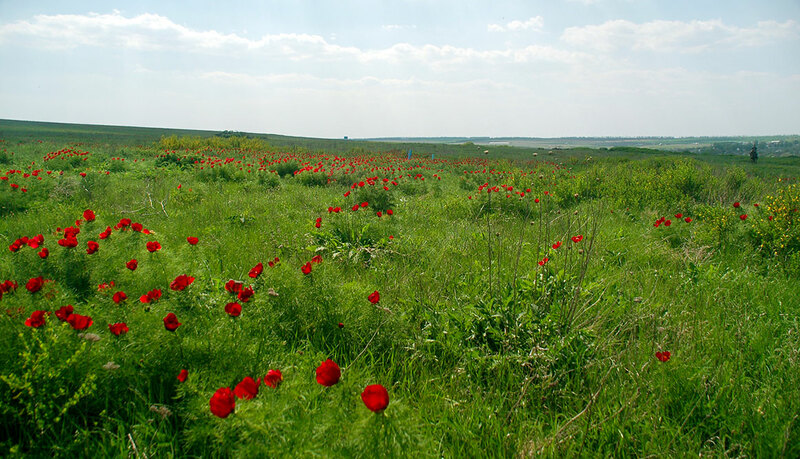 Ukraine's grasslands landscape of the Pontic–Caspian steppe. BBC current news from Ukraine. National Palace of Arts "Ukraina". Opera and Ballet Theater in Odessa. The Ukrainian Chamber is also home to the Industry International Commercial Arbitration Court and the Maritime Arbitration Commission. Ukraine's flag carrier and the largest airline operates direct flights to most major cities in Europe. Ukrainian airline based in Kiev. Ukraine's international airport in Kiev. "LOT" Transportation Company was established in 1993 and was the first private company in Nikolayev region. Development of state policy concepts in the sphere of research and peaceful uses of space, as well as in the interests of national security. 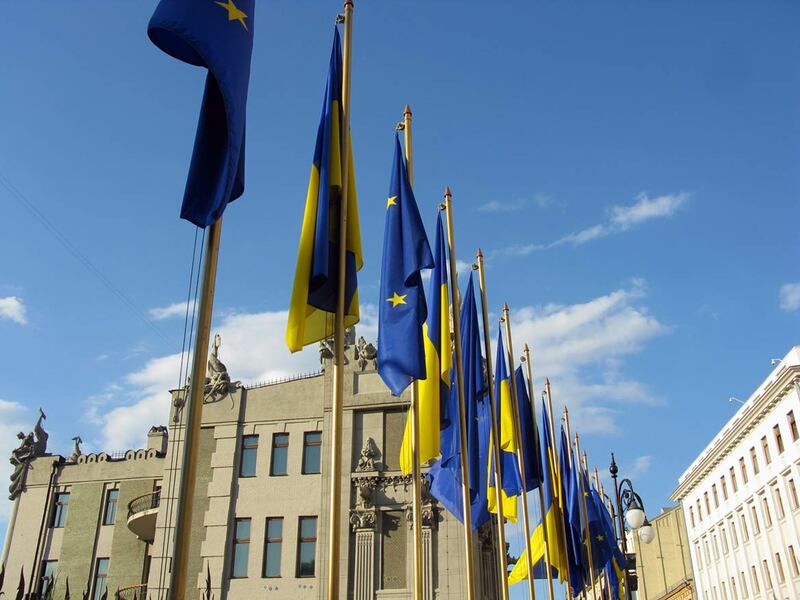 Flags of Ukraine and the European Union in front of the House with Chimaeras, Kyiv. Oldest continuously operating university in Ukraine, founded in 1661. Sumy State University (SSU) is situated in Sumy city in North-East of Ukraine and is a leading higher education establishment of the region. Uzhhorod, founded in October 18,1945. You are in Chernobyl, the site provides some information about the Chernobyl disaster. Wikipedia article about the catastrophic nuclear accident that occurred on 26 April 1986. Page about Ukraine's history from the oldest period of Ukrainian history to independence. Wikipedia pages related to the history of Ukraine.